This view is insertable, so you can fully use this view and you are not distracted by the additional column "bucket". You could even exclude column "created_at" from the view definition, if there was not bug #94550. 'created_at' could be fully handled internally. This view does not affect performance much. In my simple test it did not show any affect. Just better usability and better accuracy of TTL. You cannot use foreign keys with your ttl'ed table and view. This is because partitioning and foreign keys are mutually exclusive. If you need foreign keys go with the simple delete event procedure and forget about the view. Due to bug #94550 you have to set explicit_defaults_for_timestamp to OFF and you always have to insert NULL into column 'created_at'. In this whole setup the TTL is mentioned in four locations: In the partitioning definition, in the definition of the generated column 'bucket', in the cleaning event procedure and in the WHERE clause of the view. This makes it easier to screw up the setup. Make sure you use the same value everywhere. Same applies for the number of partitions in the table definition as well as the cleaning event procedure. A customer recently asked for a TTL feature in MySQL. The idea is to automatically delete rows from a certain table after a defined lifespan, e.g. 60 seconds. This feature is common in many NoSQL databases, but it is not available in MySQL. However MySQL offers all you need to implement this. And due to partitioning much more efficient than only deleting rows. Let's test it. Partition the table and truncate partitions in a regular event procedure, that does the trick and comes at a fraction of the cost of regularly deleting rows. Run an event every 10 seconds to delete rows that have been created more than 10s ago. And index on "created_at" might improve performance for the DELETE job. But in any case it is quite expensive to scan the table and remove roughly 50% of the rows of a table, at least if the INSERT rate is high. To verify that the procedure works as expected I created a small monitor procedure that displays each second the number of rows per partition. Then it is easy to follow in which partition data is currently added and when a partition gets truncated. This procedure is not ideal. Too many count(*) will create quite some locking. But it is accurate. The alternative is to read data from INFORMATION_SCHEMA.partitions, but this does not give the exact row count, which I needed for verification. If TTL is 10 seconds, deleting or truncating every 10 seconds means you have at least 10 seconds of rows available. In reality you will have 10 to 20 seconds worth of data, so on average 15 seconds (assuming a constant INSERT rate). If you run the cleaner job more often (say once per second) the average number of rows is 10.5 seconds worth of data. This comes at the cost of running the cleaning event more often. But it might be very beneficial to increase this accuracy because all other queries benefit from less data to operate on and less memory consumed by expired rows. If you go with the simple solution of a regular DELETE event, it is sufficient to schedule the event more often. If you prefer the TRUNCATE PARTITION option, it is necessary to increase the number of partitions or buckets to 12 (= 2 + TTL / how often to run the cleaning job). and the partitioning needs to be adapted as well. Then you keep all your rows which will likely create some follow-up problems. As always: Proper monitoring is key. Think about MySQL Enterprise Monitor for example. ... the event procedure runs at inaccurate timing due to overall system load? No big problem. It will never run too early. So it will never remove rows too early. If it runs too late it will clean rows too late so you have more garbage in your table which might affect other queries. The real TTL is increased if this happens. By no means I am able to run proper performance tests. I am running on a Win10 laptop, VirtualBox with Oracle Linux and MySQL runs inside a Docker container. So plenty of reason to achieve bad numbers. But to compare the two implementations it should be sufficient. The load was generated by mysqlslap, which only inserted rows in the table. Each test run starts the respective cleaner event, runs the mysqlslap load and then stops the cleaner event. "USE test; ALTER event ttl_delete ENABLE;"
"USE test; ALTER event ttl_delete DISABLE;"
"USE test; ALTER event ttl_truncate ENABLE;"
"USE test; ALTER event ttl_truncate DISABLE;"
INSERT INTO test.t (created_at, content) VALUES (NULL,'foo');"
Why do I mention the column "created_at" but then store NULL to give it the default of current_timestamp? If I omit the created_at column in this INSERT statement I get an error from the generated column due to bug #94550. Setting explicit_defaults_for_timestamp to OFF and then mentioning the timestamp column during INSERT is a workaround. There are different ways to configure this. 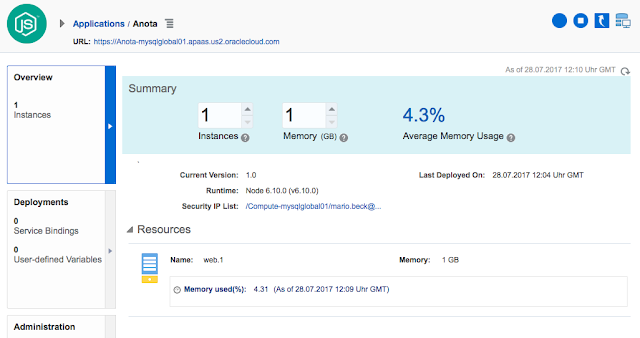 I tested the easiest deployment with MySQL Cloud Service and the Application Container Cloud for the node.js part. All configurations are done via the cloud web GUI. There is also a REST interface available. But let's keep that for later. If you don't have access to the Oracle Cloud you can get a trial access here. 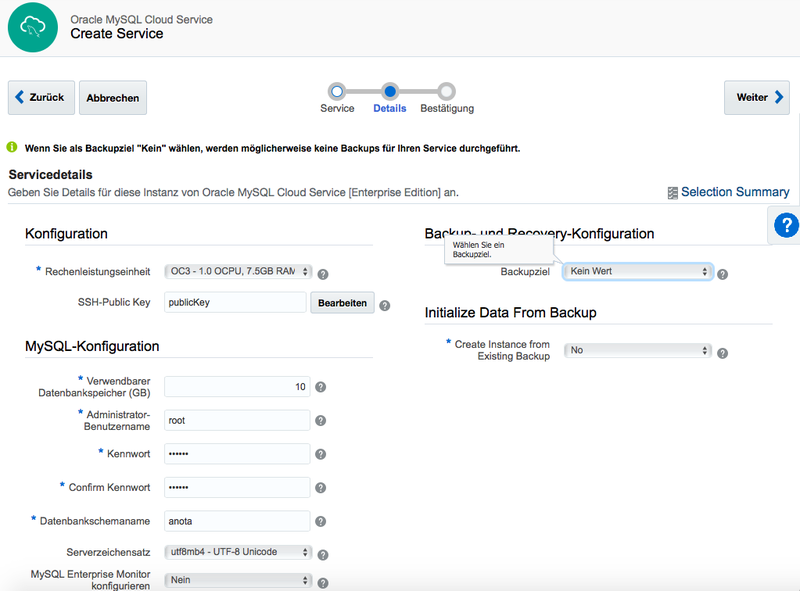 Once you logged into the Oracle cloud you can create new instances from the dashboard. The following screenshots describe the process. I skipped the backup and monitoring configurations for this demo. Let's focus on the application instead. After creating the instance (approx. 10 min) you can navigate via the dashboard to this instance and get the IP address. This is needed for the next step. To initialize the database I ran this little script that runs ssh to the instance (using the private key), switch user to "oracle" and then call the MySQL CLI to run a few SQL statements. Ideally you create a zip archive with the source code, the manifest.json file and all other resources that your application needs. If you want to use my zip archive, feel free. You find it on GitHub. 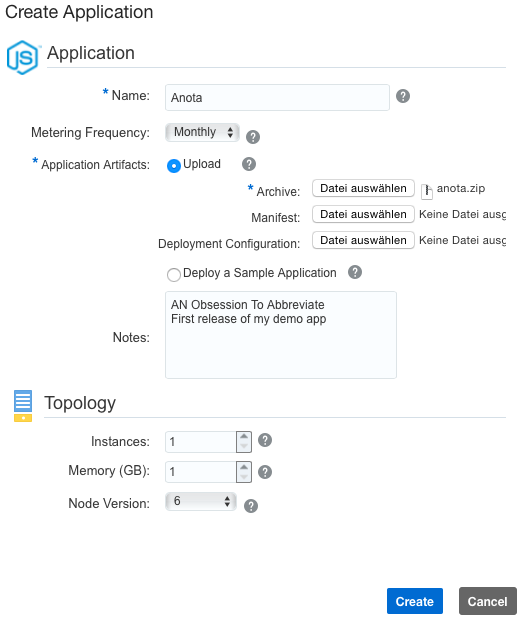 On the pop-up you define the application artifacts, number of application instances and the memory per instance. After you click "create" the application is deployed automatically within a few minutes. After modifying the service bindings you have to click "Apply changes". This will restart the application instances. Obviously needed because now the environment variables for the database backend are set correctly. That's it. We have an application. The URL to access the new app is listed in the application overview tab. Because this URL is not so nice for offering a short url service, I registered a new domain and forwarded that to the anota application. Maybe it is still running? Check here. This is really easy. 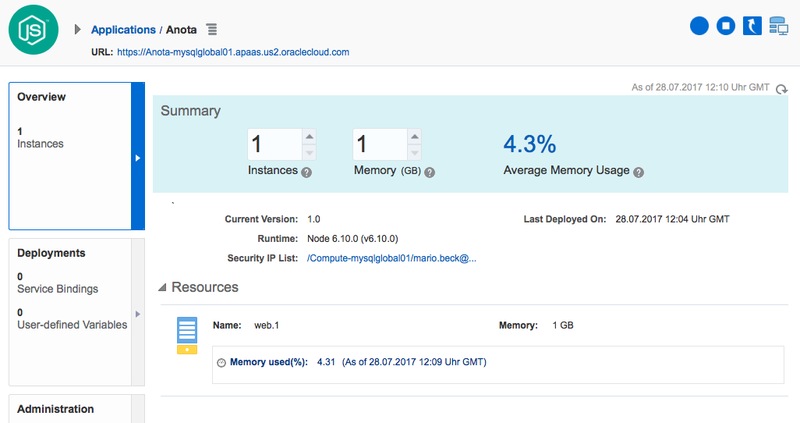 On the application overview tab you can just increase the number of instances and the memory per instance. After applying the changes, the Application Container Cloud platform will deploy new instances, stop spare instances or reconfigure the existing instances. If you use my ANOTA application, go to the report page. The last line prints the hostname of the application server. Requests are automatically load balanced between the available application instances. There are some minor changes to the application to run on the Oracle Cloud Platform: Reading the port variable and database connection parameters from the provided environment variables and that's it. Deployment is really easy via the GUI. And scalability is so simple now that the full Oracle Cloud Plattform is available and can be provisioned within minutes. // usually it is the traditional port + "0"
Starting with MySQL 5.7 we introduced the Query Rewrite Plugin. That tool is really useful for changing queries. Of course the best location to modify the query is the source code of the application, but this is not always possible. Either the application is not under your control or queries are generated from a framework like Hibernate and sometimes it is hard to change the query generation. Recently I was asked how this works in replication environments. Which query goes into the binlog? If you are using the Rewriter plugin that comes with MySQL 5.7, the answer is easy: This plugin only supports rewriting SELECT queries. SELECT queries don't get into the binlog at all. Simple. You can either bring the original query to the binlog or the rewritten query. So all flexibility you need. However be aware that --log-raw also affects logging of passwords in the general log file. With --log-raw passwords are written in plain text to the log files. So consider this side effect when switching --log-raw on or off. I did not change the query! The WHERE condition is still dx*dy. Nevertheless the optimizer finds the generated column, sees the index and decides to leverage that. So you can add complex indexes and without changing the application code you can benefit from these indexes. That makes life much easier. During our recent TechTour event the idea came up to implement JSON document validation not necessarily via foreign keys (as I have shown here) but to define the generated column as NOT NULL. The generation expression must be defined in a way that it returns NULL for invalid data. DISCLAIMER: This has already been explored by yoku0825 in his blogpost. He deserves all credit! As you can see I used the column name to create a meaningful error message when inserting invalid data. It is perfectly possible to add a generated validation column for each data column so that you run several check constraints. As generated columns are virtual by default this costs no extra storage. Data volume is the same. The expression is evaluated when inserting or updating data. If you add a validation column to an already existing table and want to verify all existing rows, you could define the validation column as STORED (instead of the default VIRTUAL). This will fail if there are any invalid rows in your existing data set. However in normal operation a virtual column seems more appropriate for performance reasons. So I recommend to always use VIRTUAL validation columns and check pre-existing data separately with a small procedure.